The Aim of the Applied Wilderness Skills Course is to teach you how to survive in Wilderness Areas. The Survival School Applied Wilderness Skills Course is probably one of the best bushcraft courses in the country. 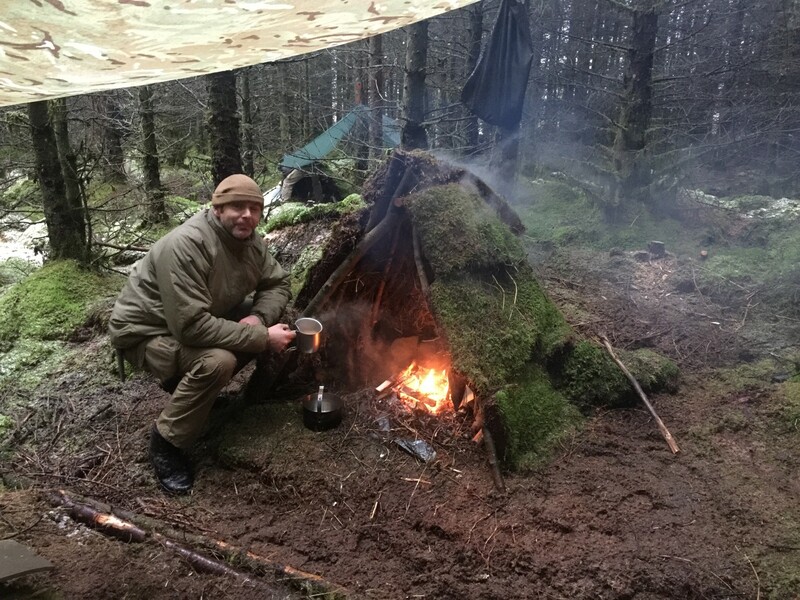 Not only do you get the best scenery in the country, but it is also a chance to live and learn bushcraft in an extreme and sometimes hostile environment. This course is about learning to live in wilderness areas and how to look after yourself and others in remote wilderness locations. This is a bushcraft course rather than a military survival course. Places for this course go quickly. You will be living rough for 5 nights. You may wish to have some clean clothes to change into for your return home. Please note that the whole course is run in the wilderness and so no showers are available. Saturday: Welcome and Safety Brief. Safe cutting techniques, setting up camp. Intense firelighting session with the emphasis on lighting fires in wet weather. Followed by individual camp set up and game preparation. Axe proficiency. The Applied Wilderness Skills Course is designed to teach you how to live comfortably in remote parts of northern Europe. The itinerary may change depending on weather, but all subjects will be covered. You will ideally need some experience of bushcraft and survival techniques, but not mandatory. We suggest you attend a course with a reputable school first. To make a booking, please call us on Tel: 01453 752220. We can take payment from credit or debit cards over the phone or you can pay online. PLEASE ENSURE YOU HAVE COMPLETED OUR LEVEL 2 COURSE BEFORE ATTENDING THIS COURSE. Our public liability insurance is with Lloyd's and the policy number is B133817SCE0007.